I am so glad I ran this game. 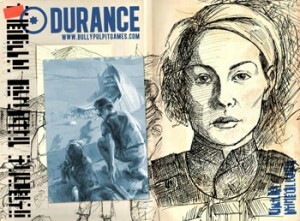 My last two times playing Durance I wanted to like the game, but felt like I didn’t quite “get it”. This time, I loved the game, and would happily play it again. In the first scene, I wanted to know about Anders. How far he was willing to go to kill Gunney Black. So I put him in a spot by asking “What will Anders do when the Governor sends Private Pennet to move him down to the tunnels?” This both threatened his oath (never to take charity) and potentially made it harder to reach his target. The answer was that he would fight like a rabid dog, get shot in the shin and be dragged kicking and screaming into the tunnels, a year of his research on Gunney destroyed. As we played, the questions drove towards powerful scenes just like that. This characters really came alive as we asked questions about them and their relationships. Rogan used to be the Dimber Damber but was usurped by Lora Balton. Wilton was his abbot but when Rogan flipped and got emancipated, Wilton was left behind and dropped down to Lag, blaming Rogan for his fall and for leaving him behind. Gunny Black was sent here for manslaughter, killing his wife, who was Anders Praham’s sister. Anders was a cop who actually comitted crimes to get himself on the planet, but was disgusted with how far he had to stoop to be caught, as all the other parts of the authority were so corrupt, they kept trying to hide his crimes, rather than admit one of their own was on the take. Irvin Walker was a religious man, one who promised a chapel that ALL could have access to. After the convicts on the surface had trashed the one he opened for them there, he erected another in the tunnels, protected by the Authority. This meant the convicts were regularly passing Authority check points “legitimately” so long as we were heading to service. So of course the church became the seat of political corruption and shady deals. Awesome! One of the things I really like that Jason did with oath-breaking in Durance, is giving several options, one of which was to change the drive of the game. We started with control, everyone vying for power in a sea of corruption. When the Governor broke his oath though (and finally conspired with the criminals to get what he wanted) the drive shifted from control to freedom. We realized as ship was coming with more convicts, and if the ship was coming, as ship was going back. When the mood shifted some wanted to restrict freedom, others wanted to gain it. It was a great shift in the game’s mood. I’m so delighted that in the 3rd scene the Dimber Damber bit it. The Governor, wrecker, and bolter all broke their oaths. The characters were really alive and dynamic. Tools of the story, rather than a commodity we were trying to maintain. It was a really satisfying experience. Tied rolls did something very cool in this game. They turned it in a direction we would have never expected. 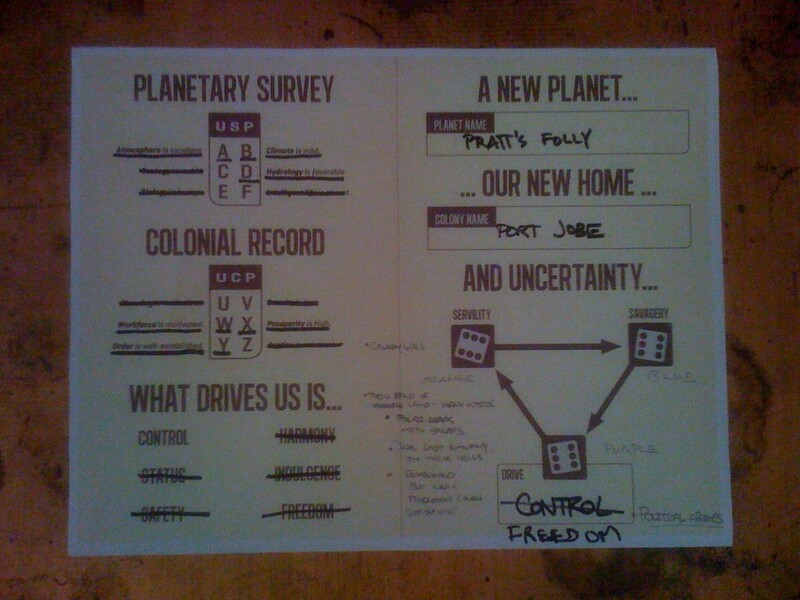 In two scenes we had to people vying for control (our game’s Drive) and we went to the dice due to uncertainty. When a tied roll came up, it totally changed the trajectory of the game, in a fantastic way. When we rolled the the whole table stopped for a moment? How was that going to fit. And suddenly it was obvious. Colt, unable to hide his zeal stood up to shout out his good fortune. Persia grabbed his coat and in doing so a ton of emeralds spilled out. Once the convicts saw them, they went mad with greed and a riot started. Trying to calm the riot Lora stood up, shouted for everyone to calm down, and in that moment, the “think with his gun marine Punnet” identified her as a the leader of this outbreak and put a bullet in her head. Suddenly the game changed completely. The marine had fired his weapon in the chapel and killed the Dimber Damber. The criminals now had a huge power vacuum, and we pretty much spent the rest of the game figuring out how that vacuum was going to be filled. The experience was never something we would have thought of as a group. In fact if someone had mentioned it I think we would have cast it off as ridiculous. But creative constraints are awesome. Now, this thing happened, we would have never expected and it changed the game completely. I loved it! We had some discussion after the game about how having multiple notables, and not being able to frame a scene for yourself affected the game. 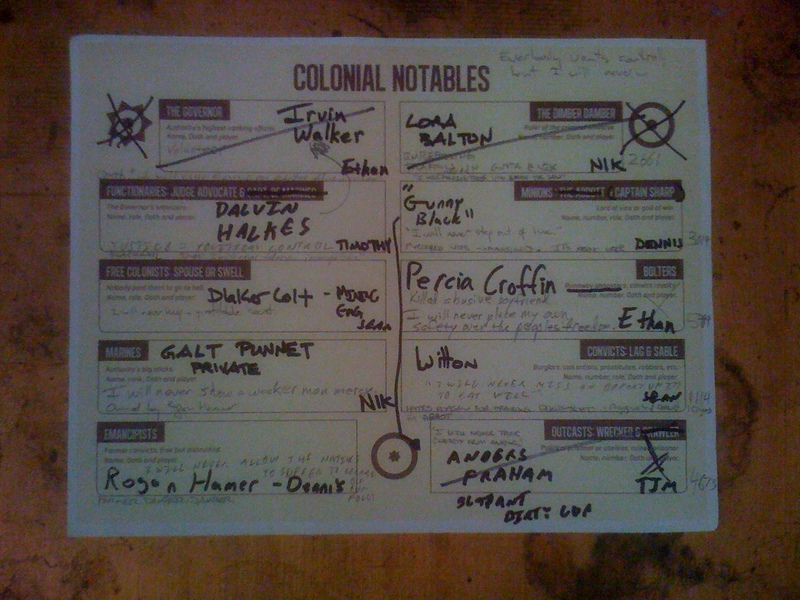 I think this was a very intentional design from Jason as an attempt to shift the focus from “my PC as my avatar into the game” to “these are all the characters that we as a group are collectively interested in telling awesome stories about.” This is something I’really excited about personally because I think the my character is my avatar style of play leads to investing in a character doing “winning” when so often the best stories are about characters falling on their face. Not pathetically so, but tragically so. During the Improv for Gamer’s workshop, one of my favorite exercises was called Death in 30 seconds. And I loved the idea that we had to have a 30 second scene where someone WOULD die. You can’t protect your character, you don’t want to protect your character, you want them to die spectacularly. I can’t add much to Sean’s report except to say it was really awesome when that tied roll came up and somebody was going to die. And I looked at the scene playing out, at the really cool Dimber-Damber I had thought up, and actually had some plans for, and realized it had to be her. We had struggled a bit in the first two scenes to get the story going, as the game had started with things at a stalemate. This insane death pulled out a critical piece of the stalemate, which meant that *everything* was now in motion. From then on it was more a matter of deciding which characters we wanted to play with than searching for something to “make happen”, because everybody was involved. And Punnet, the character I’d made up on the spot with no real thought, wound up dominating the story in many ways!